Written and photographed by Aja Bain, Historic Nashville blogger. 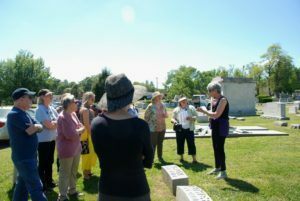 On May 7, HNI members joined Jean Roseman, author of Shalom Nashville: A Jewish History and From Y to J: The Hundred Year History of Nashville’s Jewish Community Center, on a tour of the historic Temple Cemetery in North Nashville. 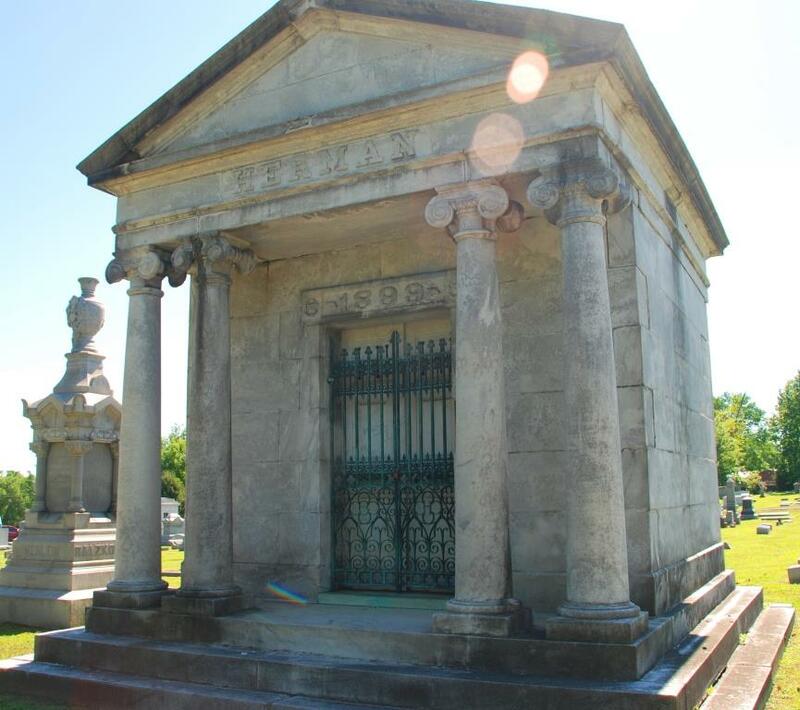 Established in 1851, the cemetery was listed on the National Register of Historic Places in 2004 and holds the graves of many prominent Jewish Nashvillians from the community’s earliest days. 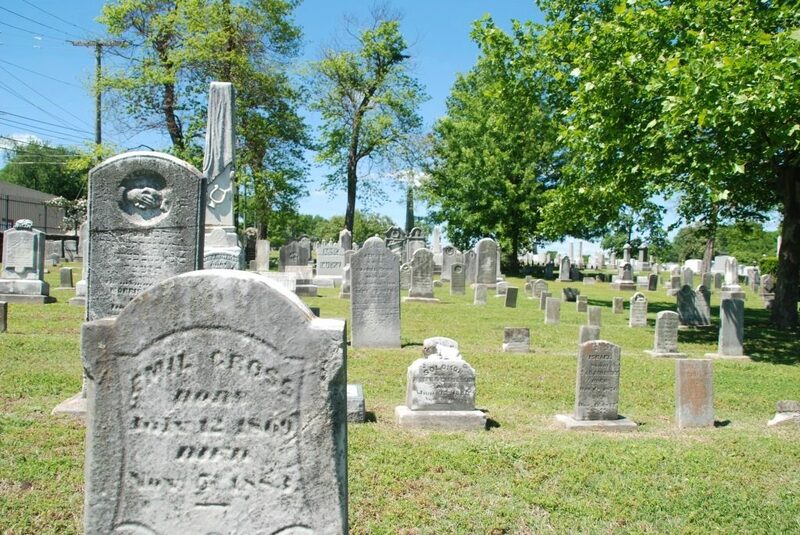 For a full list of burials, visit the Davidson County Cemetery Survey Project. Ms. Roseman began the tour with an introduction to Jewish burial and mourning customs and an overview of Jewish migration to our city. The population was always small, never more than 3% of the city’s people, but was remarkably influential and experienced growth after both the Civil War and World War II. The first Jewish settlers are recorded as having arrived in 1795, although the first official religious gathering didn’t take place until 1848. Nashville’s Jewish community came primarily from Germany (often via Cincinnati), and many families found great success in the city by becoming merchants and industrialists. During the nineteenth and early twentieth century, a tradition of philanthropy and civic pride blossomed in the community through local chapters of the Young Men’s Hebrew Association, the National Council of Jewish Women, and other organizations dedicated to education and culture. 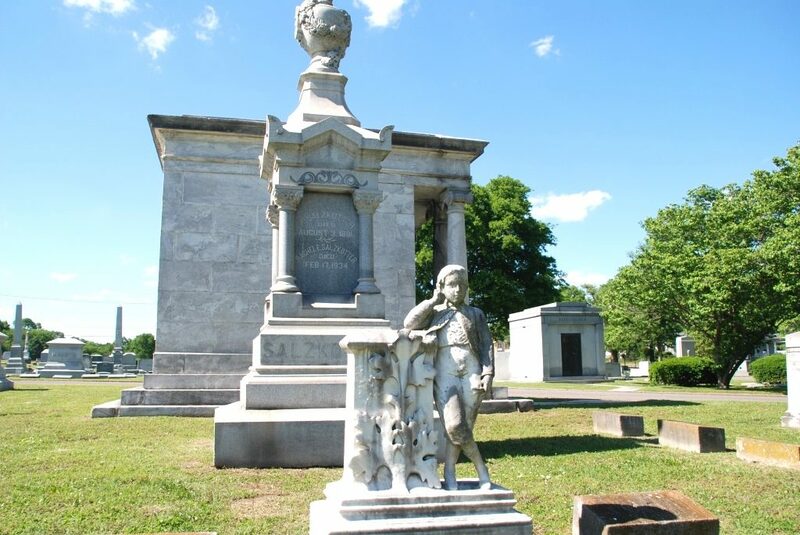 Many names in the cemetery were familiar to longtime Nashville residents and town historians: the Mays of May Hosiery Mills, the Kuhns of the Big K stores, the Werthan family of the Werthan Bag Company, the Lovemans of Loveman’s department store, and several others. Other historic graves of note include that of Rabbi Isadore Lewinthal, beloved leader of the downtown Vine Street Temple from 1888 to 1922 and a figure on Red Grooms’s whimsical Tennessee Foxtrot Carousel. Salzkotter family graves: 1872, 1891, and 1934. Historic Nashville is committed to preserving our city’s significant Jewish history and sites. 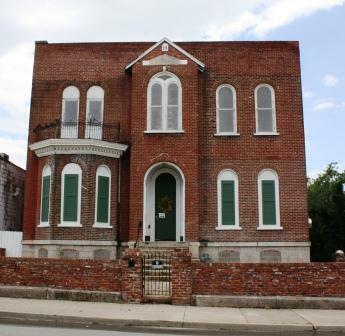 In 2010, we included the Iser-Bloomstein House/Workmen’s Circle Hall, the city’s oldest Jewish landmark, on the Nashville Nine list of endangered properties. This antebellum townhouse in today’s booming SoBro neighborhood dates from 1859 and was connected to several prominent Jewish Nashvillians and the Workmen’s Circle Jewish-American fraternal organization. The structure was saved from demolition and renovated for commercial use, but has since closed and been purchased by a real estate development company. HNI remains concerned about the future of this structure and continues to advocate for its preservation and adaptive reuse. Read more about Nashville’s Jewish history at the Goldring/Woldenberg Institute of Southern Jewish Life. Join Historic Nashville today to take advantage of member-only tours and events, and view our full schedule here.